The level of production: You find this info in the production budget. The beginning direct materials inventory: To get this information, go to the production budget for the most recently completed period. The ending direct materials inventory the company wants: Set this target at a level that ensures you have enough direct materials to feed production in the next period. The direct materials that go into your products: Base this figure on how you designed your products. The cost of direct materials: Obtain this projected price from the purchasing department. The outputs are the level of production already noted in the existing production budget. 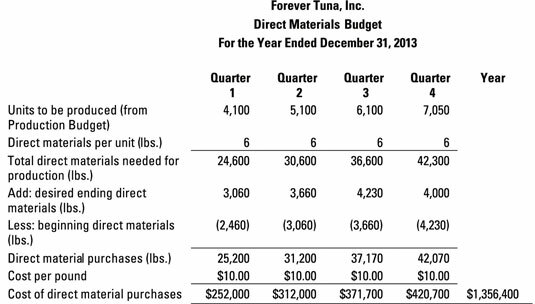 For Forever Tuna’s level of production, use the production budget shown. Assume the company started its first quarter with 2,460 pounds of direct materials inventory. Managers like to have 10 percent of the following period’s direct materials in inventory at the beginning of each period. Because the company estimates that it’ll need 40,000 pounds of direct materials in the first quarter of 2014, it’ll need ending direct materials of 4,000 pounds at the end of the fourth quarter (which is 10 percent of 40,000). Six pounds of tuna fish go into every case of Forever Tuna. The company pays $10 per pound for tuna fish. To compute the direct materials needed for production, multiply the number of finished goods units to be produced by the cost per unit. This calculation gives you the total direct materials needed for production. Next, following the budget formula, add desired ending direct materials and subtract beginning direct materials, to get the total direct material purchases needed. Multiply this amount by the cost of the direct material units to arrive at the total cost of direct materials. This direct materials budget indicates that the company needs to purchase $252,000 worth of direct materials in the first quarter; $312,000 in the second quarter; $371,700 in the third quarter; and $420,700 in the fourth quarter.